A Humboldt fishing contest gives you three months to land a catch. It may not be enough. The life of a steelhead fisherman isn't recommended. Nor is the life of someone dating a steelhead fisherman, for that matter, as a steelhead fishermen's life is one filled with equal parts obsession and frustration. Ask any steelheader, and he or she will talk of the need for a thousand casts before even getting a glimmer of one of these chrome fish. You'll hear of waiting and hoping, and of praying that the river in front of him or her isn't just loaded with steelhead but that it runs emerald green, clear of soil from the last rain. True steelheaders are forever grateful for rain, even if they curse its arrival under their breath. Rain creates the river flows that give these magnificent creatures life and allows them to swim out to sea in their first years, and, then, to return to the spawning grounds from which they came. And when they return back to the rivers, they do so with bellies filled by the ocean's bounty. But the amazing life cycle of these fish and the conditions that help them flourish simply don't take into account the needs of a fisherman. About four years ago, Dave Feral was one of these, tugged to the Mad River by the chance of catching one of these fish. While on the river, he had an idea: Create a contest in celebration of these wonderful fish that would raise money for environmental restoration projects to help the steelhead while also offering prize money for the biggest fish caught. In short order, Humboldt Steelhead Days was born and has now grown into a three-month long, countywide "celebration of all things steelhead." 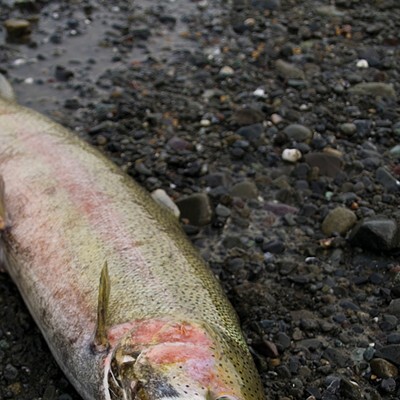 A steelhead is a trout, a rainbow trout, to be exact. Their genus is the same, and family, origin and design all point in that direction. They are rainbows that decided to head to the ocean and come back after gaining valuable feeding strength and survival skills thugging around in the vast Pacific Ocean. But when these fish survive ocean predators, they return to the river confident and strong. That means that when one of them gets attached to the end of your fishing line, you should be ready for the fight of your life. During Humboldt Steelhead Days, anglers from all over descend upon our county for the three-month contest, which sees $10,000 in prizes dolled out to the biggest catches and best fish photos. With a $10 entry fee, a registered angler gets to compete against all comers for the contest's holy grail: a $1,000 cash prize for the contest's largest fish. But Steelhead Days is probably equal parts concert and festival, with guided river walks, restoration tours, art shows and river clean-up days. Its proceeds go toward the restoration and rehabilitation of the three rivers — Mad, Eel and Trinity — featured in the competition. If the length of the three-month contest period — which runs from the first of the year through March 31 — seems laughably long, well, you've clearly never spent much time fishing for steelhead. Rain is exactly what the fish need but it also creates long stretches when the rivers aren't fishable, colored a deep, silty mud with flows that can cause severe flooding. 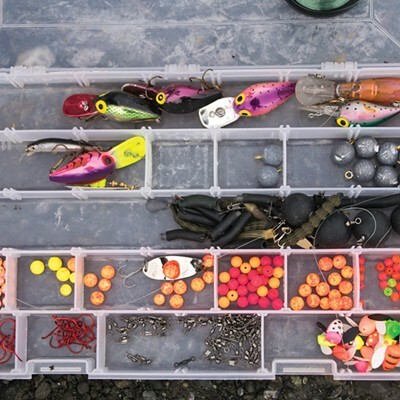 Often, this long contest period will pass having offered only a handful of fishable days. Though the rivers can still be fished with muddier waters or lower flows, the chances of a bite are exceedingly higher when the rivers flow a swollen and clear green. The other tricky thing about fishing steelhead is the simple fact that the trout doesn't eat after re-entering the river. The fish that return back from the ocean do so with only one goal: to get upstream, back to exactly where they were born and spawn. You might be wondering how you can catch one of these fish if they don't eat. The one thing working in anglers' favor here is that steelhead are notoriously territorial and fierce in the face of competition. 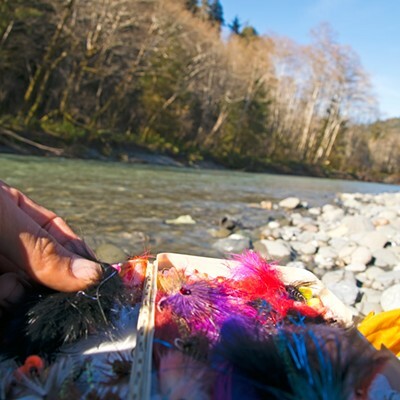 A bouncing salmon egg along the river bottom, a silvery flash of a lure or a colorful fly are all considered threats to the fish and their future generations, prompting steelhead to bite. 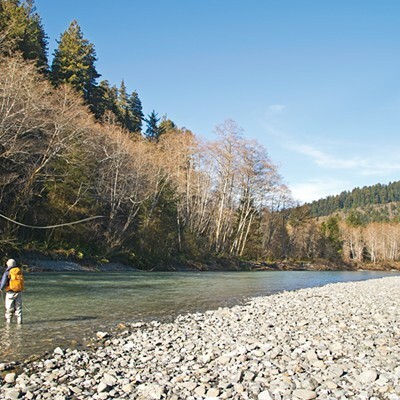 While Humboldt County has a plethora of rivers, the Humboldt Steelhead Days contest and conservation aim surrounds just the Eel, Mad and Trinity — three very different rivers with variances in length, flow, color, geography and fish. 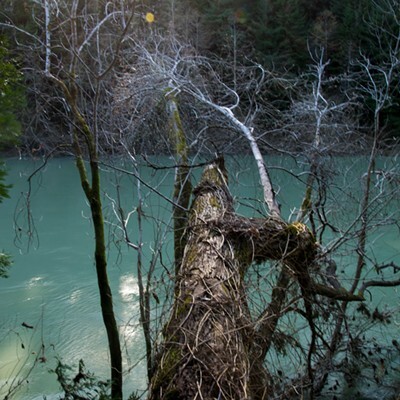 Without question, the Eel River is largest and most powerful of the three. 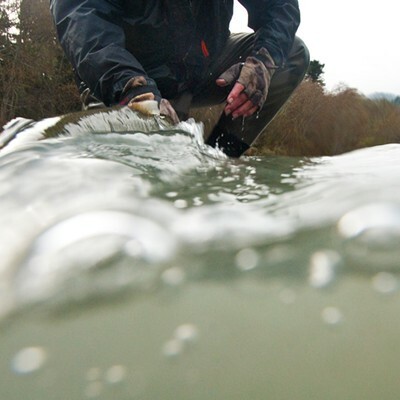 With winter flows that rise to ridiculous levels, this river holds the most wild steelhead. (It also offers the chance to catch one nestled deep in Humboldt Redwoods State Park.) The Eel, however, requires the utmost patience in waiting for it to clear after a heavy rain, due to it size, past logging and the cultivation of weed and wine near its banks. 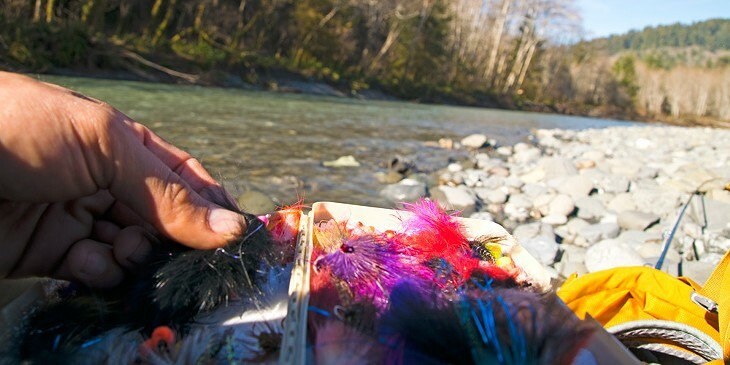 But once the stars align, a swung fly or a cast lure can offer the chance to land a large wild fish. The Mad River, on the contrary, is all about convenience, as it lies near the developed areas of McKinleyville and Arcata, making it the best after-work fishing spot in the county. With a ton of access points all the way from Maple Creek down to the fish hatchery in Blue Lake, and even 200 yards up from the ocean, miles of fishable water offer both hatchery and wild steelhead. Of course, with the river being so close to civilization, it gets a bit crowded. Nonetheless, the fishing is good, whether fly or traditional. With its biblical name, the Trinity can be considered the Holy Grail of the region. Meandering over the hill past Willow Creek and down to the Hoopa Valley Reservation, the Trinity is one of the larger feeding tributaries to the mighty Klamath River. Steelhead and salmon both swim from the ocean, and up the Klamath to get to these spawning grounds in the Shasta-Trinity National Forest. 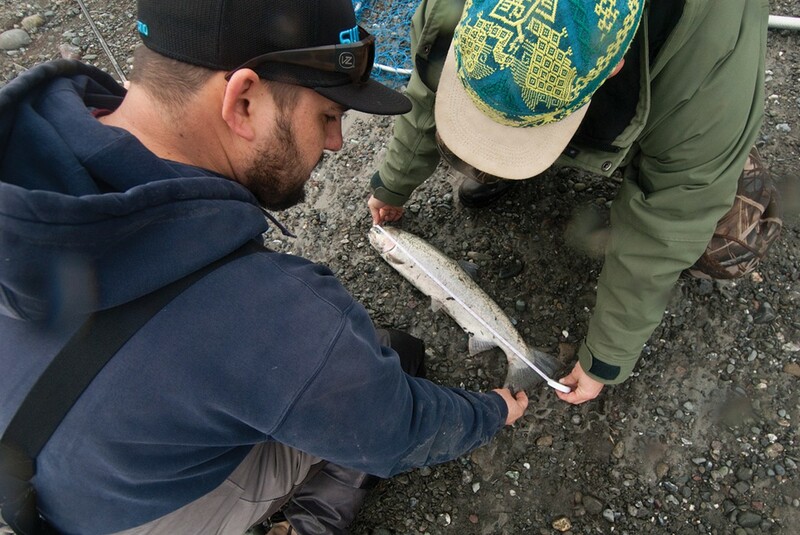 While steelhead can be found in the river year round, it's the adults that swim back from the ocean, escaping hundreds of waiting anglers at the mouth to start the journey up river. It begins in the fall, shortly after the salmon rush of summer, when the river becomes a haven for the beautifully colored steelhead, and continues through winter. It's important to note that wild steelhead are a threatened and protected species, so if you catch one, it's against the law to keep it. Hatchery steelhead, or those born in a fish hatchery and released into the rivers as juveniles, are legal to keep, with some restrictions. Please check fishing regulations or call the California Department of Fish and Wildlife for the latest limits and requirements. Anglers can tell the difference between wild fish and their hatchery counterparts by their fins. Scientists and volunteers have removed or clipped a small back fin, known as the adipose fin, near hatchery fishs tails before releasing them into the wild. 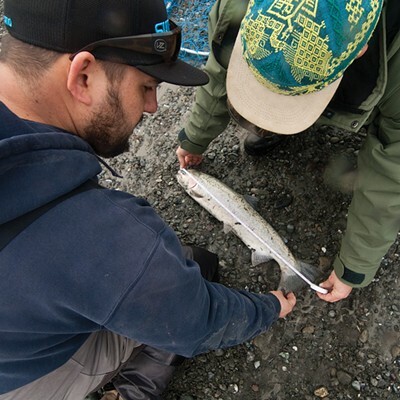 So an angler who catches a steelhead must check whether the fin is absent or cut from the fish to confirm it's a hatchery fish and legal to keep. If the fin is there, it's a wild-born steelhead that must be released. The penalty for keeping a wild fish is substantial: a minimum fine of $500 and the confiscation of all fishing gear — starting with rods and reels, and potentially extending all the way to boats and vehicles — associated with the catch. So it pays to know the difference between hatchery fish and their wild counterparts, which are a marvel of evolution. Wild fish survive the thrashings of being simple finger food as fry in the predator-laden rivers where they were born. They then escape the gauntlet downriver in their first voyage to sea, which ultimately exposes them to a world of unfamiliar predators and conditions. After surviving all that the ocean throws at them, the fish escape the grasps of countless hungry seals at the river mouths to return to fresh water chrome bright, clear finned and full of piss and vinegar from their experience at sea. It's likely this experience that leaves anglers facing a fierce fight when trying to land a steelhead. And it's this fight — coupled with the rare conditions that make it possible — that make landing a steelhead such a prized experience. I'll always remember my first. It took more than a year's worth of casts — and untold frustration and obsession — before I felt even a tug on the end of my line. I'll never forget reeling it in and bending down to remove the hook from its mouth. The fish had scars all over its body and sea lice still attached from its time in the ocean. I gazed into its eyes and wondered what they had seen before slowly turning it around and letting its tail slip slowly out of my hands to watch it swim back into the river. I stayed crouched with my hands on my knees, in awe and feeling like I'd just read a masterpiece of a story. It's a story that spans generations and demographics, one that speaks to anglers all over the West Coast and beyond. It's a story worthy of celebration. Sean Jansen is a freelance photojournalist based in Humboldt County. He specializes in capturing the spirit of outdoor adventure on and off land. Calling the area home for a decade, he hopes to continue documenting outdoor activities and inspiring others to enjoy nature in Humboldt County and beyond.